In his first papal visit to northern US cities, Egypt's Coptic Orthodox Pope Tawadros II is sending clear messages of trust in the Egyptian leadership, comfort and unity concerning the circumstances of Copts in Egypt and hope in the future of the country. Pope Tawadros II left Cairo on Thursday 13 September for his first stop in Cedar Grove in New Jersey. The pope's tour includes New York, New Jersey, Florida and California. The organising committee member of the US visit Osama Ibrahim told Al-Ahram Weekly that the pope was expected to inaugurate 20 new churches in New York among a total of 68 during his tour, all under the auspices of Bishop David, bishop of the Coptic Orthodox Church of New York and New England dioceses. The pope is expected to spend 29 days in the US. He is staying in New York until 5 October, after which he will fly to Florida, then leave to San Francisco in California on 7 October, Ibrahim said. Tawadros’ visit to the US is his second since he became leader of the Coptic Orthodox Church of Alexandria in November 2012. The first was in 2015 when he met the Coptic community in the western state of California. Around 900,000 Egyptians reside in the US, according to 2017 figures from Egypt’s Central Agency for Public Mobilisation and Statistics (CAPMAS). 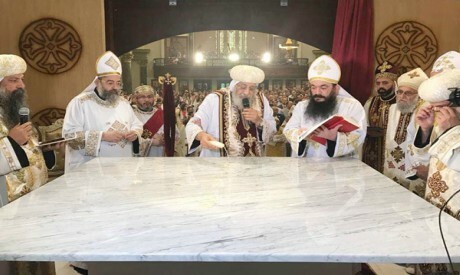 During the holy mass at the inauguration of a new church in Queens in New York, named Queen Helana Church, Tawadros II gave a sermon in which he spoke to the congregation about the latest developments in Egypt. Tawadros II stressed that the leadership of Egyptian President Abdel-Fattah Al-Sisi prioritises unity among all the Egyptian community and understands the great danger of divisions and fragmentation that destroys societies. “The president leads the country like a maestro, and he refuses to name citizens by their religion. We are all one, but in some places, Egypt suffers from ignorance and intolerance,” the pope said, highlighting that changing people’s way of thinking needs time. He then warned the Coptic diaspora about fake news, highlighting that many news stories concerning Egypt and the Coptic Church are sometimes manipulated. “Do not listen to most of the news; 99 per cent of Facebook news is false and fake,” Tawadros II said. Manal Rizk, 53, who was among the congregation at the newly inaugurated church at Queens, spoke to the Weekly on how she felt when listening to Tawadros II. “I felt that all the statements concerning fake news are really true. It was good to hear this from His Holiness. It makes me feel more comfortable,” Rizk said, adding that the younger generation always has mixed thoughts when reading the news, but that the pope knows how to reach them. Speaking on improvements that have been made in Egypt, Tawadros II said, “Egypt, like any other country, has white, black and grey pages”, but that the situation has been improving over the past five years. Among the signs of improvement, he pointed out, is the road network where around 3,000 kilometres have been added. He added that Egypt is a developing country whose “budget and capabilities are limited”. Nonetheless, he said that the political leadership has a sincere desire to resolve existing problems. No one can deny the existence of issues inside the church and in the community, Tawadros II said, but they are being calmly resolved. Commenting on the pope’s messages, Coptic thinker Kamal Zakher told the Weekly that Tawadros II had presented the issues in a very balanced way. “It is the first time that a pope speaks openly about the issues and deals realistically with the situation,” says Zakher. Speaking about the church’s situation in Egypt, Rizk agreed with the message brought by the pope that change takes time. Andrew Amir of the congregation at the Church of Saint Mark in Boston told the Weekly that the congregation rejoiced over the visit “and the blessing of his holiness” because such visits are not often repeated.